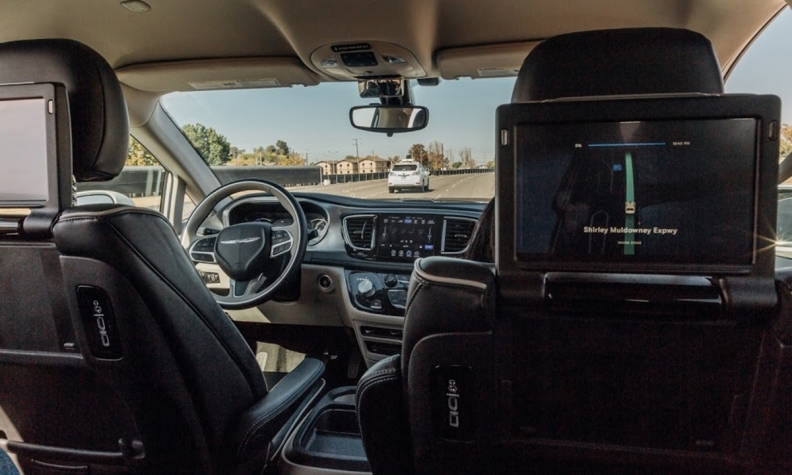 The interior of a Chrysler Pacifica minivan outfitted with Waymo's self-driving technology is demonstrated at the company's Castle testing facility. ATWATER, California -- Waymo CEO John Krafcik is confident the company is "really close" to removing the driver from the driver's seat. But much work remains, including figuring out a business model and timeline. Google's self-driving car unit opened the doors to Castle — its private testing facility here — to reporters on Monday, showing what progress it has made so far. 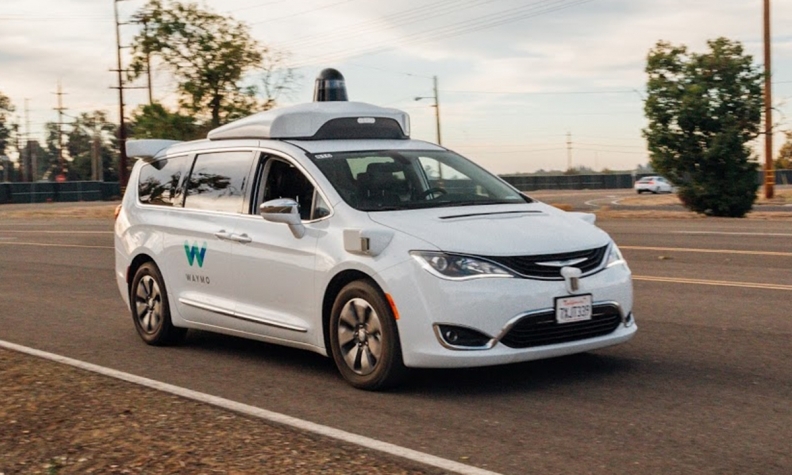 Waymo offered testing demonstrations and driverless rides in Chrysler Pacifica minivans fitted with self-driving technology. Waymo's goal is bringing Level 4 automation — meaning the vehicle can drive without human supervision in defined conditions — to the public. "All of the folks playing in the [Level] 4 space right now have drivers in the driver's seat," Krafcik said. "We're really close. I won't give a specific date, but we'll do it when we're convinced we're ready." Under Google, and now as a standalone entity, Waymo has been developing self-driving technology for eight years. As a tech company without the gradual development of a traditional automotive product cycle, Waymo is jumping straight to a system that requires no human interaction, with a heavy focus on shaping a new passenger experience. A Chrysler Pacifica minivan maneuvers through the Castle test facility. Waymo's test site is housed in a gated-off former Air Force base, where bomber pilots used to train in the 1940s. Since 2013, the company has been using it to run reliability and validation testing, running the car through various situations, such as a cut-in on a highway entrance or a vehicle quickly pulling out of a driveway, to ensure the software consistently detects changes and reacts. Waymo has run about 20,000 such tests, in addition to 10,000 testing miles on public roads and 10 million miles in virtual simulations per day. On a closed loop at the test facility, Waymo's vehicles could capably handle a variety of situations without a safety driver in the seat. The car entered and exited a roundabout with an oncoming vehicle, navigated a freeway entrance and maneuvered around stopped vehicles. The cars also detected oncoming pedestrians and cyclists — referred to internally as "faux," pronounced "fox," short for faux traffic — coming to a slow stop as they approached the road. A set of buttons is accessible to passengers in the second row. Waymo's self-driving vehicle development is focusing heavily on how passengers will use and interact with its vehicles, informed primarily through its self-driving pilot in Chandler, Ariz.
"The challenge of the in-car experience is to transition people from the paradigm of the driver, which has existed for over a century, to a full-time passenger," said Juliet Rothenberg, Waymo's product manager for user experience. 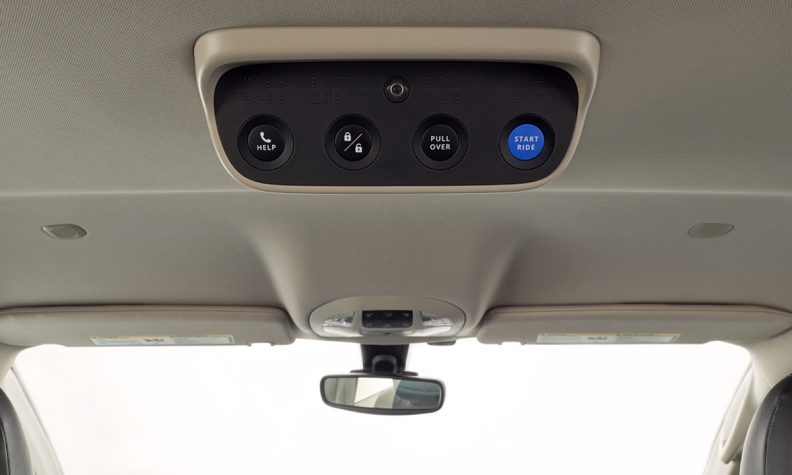 The company is approaching the shift with a set of buttons accessible to passengers in the second row, consisting of a "start ride" button, a "pull over" button, door lock button and a help button, which contacts a member of Waymo's help center if passengers are in need of assistance. Passengers can also see what the car is interpreting from its sensor suite. Screens on the backs of the driver and front passenger seat show a simplified version of the real-time map created by the lidar, radar and camera sensors on the vehicle, showing nearby pedestrians, traffic lights, the projected route and the posted speed limit. A pulse every five seconds highlights the other objects the sensors pick up, such as trees and buildings, that aren't in the way of its driving path. "We obsess over the right amount of information to show at the right time," said Ryan Powell, head of user experience design at Waymo. The result is an accurate, easy-to-understand view of the car's field of vision, that clearly communicates it sees and understand critical situations like a construction zone to the right or a bicyclist about to cross its path. Unlike other manufacturers working autonomous vehicle technology, Waymo did not give a timeline for when its self-driving cars will be available for public use. Krafcik said the company was exploring business models of ride-hailing, trucking and logistics, public transportation partnerships and licensing to automakers, but has not decided on exactly how the platform will be deployed. Despite the lack of details on its business plan, Waymo is claiming it has the most capable sensor suite of any technology available, able to see nearly 1,000 feet ahead in a 360-degree view. Both its self-driving hardware and software were developed within Waymo, and its in-house lidar designs have become the subject of a highly publicized trade secrets lawsuit against competitor Uber. Though Waymo is going it alone on much of its technology development, it has partnered with ride-hailing company Lyft, car rental company Avis and Fiat Chrysler Automobiles to explore autonomous vehicle fleet deployment and maintenance. "It's super early days," Krafcik said. "We're pursuing multiple products at the same time, which one will be first, we'll have to see."